The Riverford Kitchen is the kind of place that gets you excited before you’ve even got out of the car. Set in the stunning Devon countryside on a farm, we were lucky enough to arrive on a beautiful summer’s day. The building itself is homely and inviting, a high ceilinged modern glass-fronted barn, with an open front-of-kitchen, walls decorated with drying flowers and herbs, and blackboards listing their own-grown vegetable ‘Seasonal Stars’. I had called the day before to book and let them know my daughter and I are vegan, and also ask if we could bring our dog. 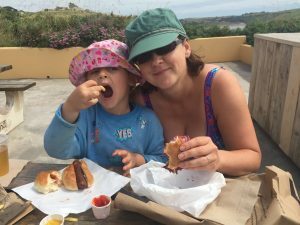 Places that are child- and dog- friendly are always a happy find, but when the food is this delicious it’s worth shouting about it as loud as you can. 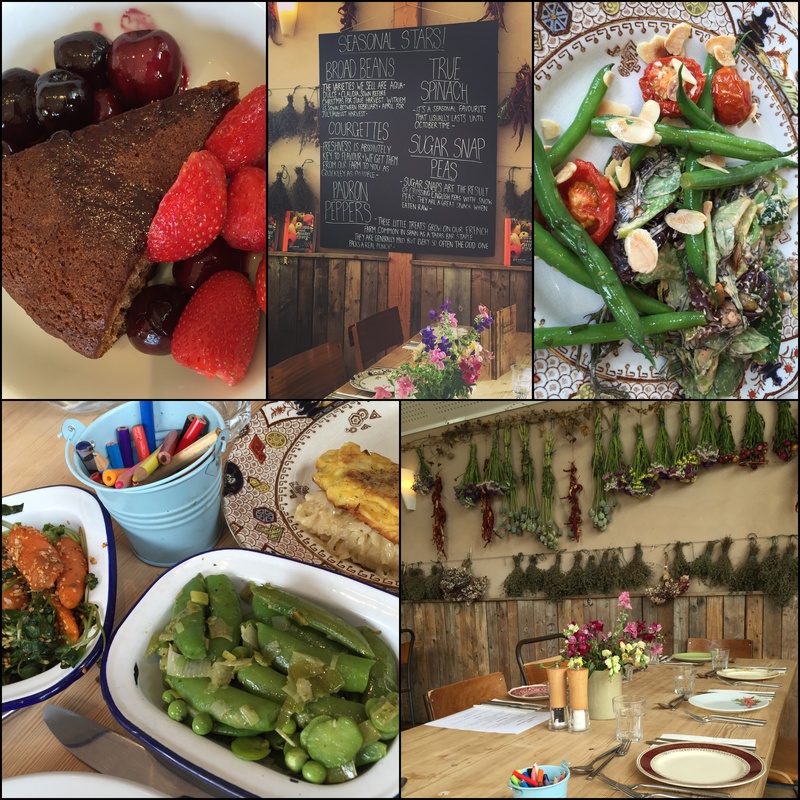 The communal tables are adorned with fresh-cut sweetpeas and mismatched crockery, and the food comes on big sharing plates for the entire table so you instantly absorb the country kitchen feel. The starters were by default vegan so we all tucked into to fine beans in a tarragon and elderflower vinaigrette with toasted almond flakes, and farm leaves with a cashew dressing with soy pumpkin seeds and sultanas – it was the best dressing I have tasted and I could have drunk it by the jugful. It’s funny when a simple, unsung part of a meal like a salad dressing can be the talking point of the whole table. 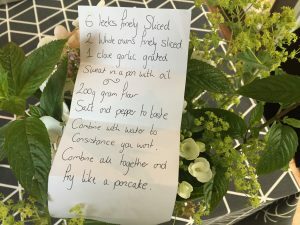 While the rest of the table tucked into their main course, Ruby and I were presented with our own plump little leek galettes which sat snugly on a bed of soubise sauce (a kind of – vegan – béchamel with finely chopped onion). Had I not been in company I would have licked the plate clean. We had thoughtfully been provided with our own side dishes of carrots with dukka (an Egyptian blend of nuts and spices) and fresh peas, broad beans and sugar snap peas prepared minus the cheese that was on the other sharing platters. I asked for the recipe and share it with you as they kindly wrote it down for me – note the water should be sparkling. Simple yet perfect. The service is relaxed but in no way frustrating. For dessert, table-by-table you are called up to the kitchen to pick two of whatever you fancy. Cakes, tarts and puddings are all laid out and run though by the chefs. There were about seven choices but all contained dairy. 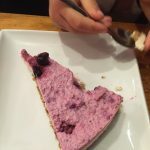 However, they had specially prepared a vegan spiced fruit cake, nicely dense and wonderfully gingery with fresh strawberries and juicy cherries that disappeared pretty quickly before invading spoons reached our plates. Seven dairy choices and they wanted to try ours! This is the kind of place where you can really relax, knowing that no animal products have snuck on your plate. The kind of staff that respect your choices and serve you your food with friendliness and thoughtfulness. Even the wine list here depicts what is vegan-friendly. If only all places were like this – making veganism as simple, healthy, easy and delicious as we know it can be. If you are passing, I cannot recommend this place enough. In fact, make a detour. We do not visit zoos, instead we like to visit sanctuaries and support the people who dedicate their time to rescuing, rehabilitating and rehoming abused or abandoned animals. We passed the Mare and Foal sanctuary en route to somewhere else and decided to make an impromptu stop. Dogs are not allowed, so my daughter and I had a quick visit while her dad dog-sat Poppy in the car park and made use of the one bar of reception on his phone. I would have loved to have spent longer here, but the half-hour was a lovely one. We went into the first stables where about 12 horses are kept. Each horse had a little information sheet about its age, type, name, character traits and circumstances that led it to the sanctuary. As we stroked their velvety soft noses, looking into their big, wise eyes, we wondered how anyone could abandon or harm these majestic and kind animals. How very lucky they are to have now found themselves in such a caring and loving environment, and how lucky we are to be able to visit and meet them all. 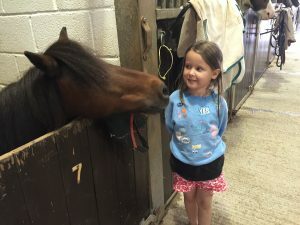 They have many events here, are really family-friendly with an educational room for kids and a fun mini clipboard quiz to take on the farm tour. Quiz forms handed in enter a draw to win a year-long pony sponsorship, although you can sponsor horses or donate online anytime to help the sanctuary. There is a café on site that overlooks the indoor training area, making a fun view for the kids (and grown-ups!) Although there is nothing specifically vegan on the menu, I spoke to the cook who was very open to mustering up something vegan-friendly on the spot. 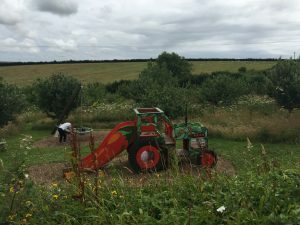 It’s free to look around and to park, but there is a donation box at the front which appreciates being fed coins and notes to help the sanctuary continue with the wonderful work it does. This came up as our nearest vegan-friendly café, so we headed here excitedly for breakfast. Set in an impressive community centre in the middle of town, the café is up on the first floor above a gallery. Bright and airy inside with a delightful back garden, it feels like a little gem, somewhere to linger over a healthy, organic, lovingly prepared meal. 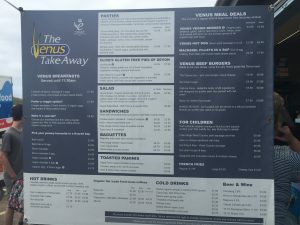 So I was very disappointed that despite checking their website for opening times, there was no mention that the breakfast menu is only available on a Saturday. Not much good for this particular Monday morning. On offer instead were scones (not vegan) or chocolate and avocado cake. My daughter was thrilled to be eating cake at 10am, especially this one which was delicious. I sulked over my coffee, and a few moments later I decided to ask the chef if he could muster something that resembled a healthy start to the day. The breakfast menu sat teasing me on the counter (smashed avocado on toast – argh, my favourite), as did the lunch menu freshly chalked for the day – but not available until 11.30. My face must have fallen enough to rouse the pity for them to rustle me up a bowl of homemade hummus and a sunflower seed studded, paprika spiked, smoky roasted cauliflower salad. A titillating taste of the food here – had I come on the right day at the right time. The café was filling up with regulars and their dogs by the time we left at 10.30, creating a nice community vibe. Although I couldn’t settle down with the big plate of food I’d so hoped for, it is obvious that the food here is worth a visit. There is apparently a good market on the square opposite on a Friday. 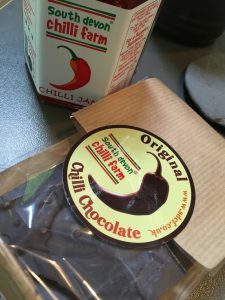 Makes a nice stop off for a bite to eat, a play for the kids and a look at the hundreds of chilli varieties grown on the farm. Lots of the chilli jams, oils, sauces, salsas and chocolates in the shop are vegan-friendly and make nice gifts – to yourself. You can sample pretty much all of their produce, and it’s all clearly labelled with ingredients and heat levels. There is a rather charming little café with indoor seating, or outdoor if you want to appreciate the beautiful countryside. Dogs are allowed (on a lead) in the outside areas bar the playground – which is a very sweet area, perfect if you have kids in tow and need a stop-off point to let off some steam. There is a swing and tractor for them to play on while you enjoy a nice coffee (soya milk is available). Although there are no specific vegan options on their Mexican-style lunch menu, there are a few veggie ones that can be tweaked, such as a veggie burrito or nachos (all look very homemade, fresh and delicious). When we visited, there was a pomegranate and oat flapjack that was vegan on offer which was gratefully scoffed. Free to park and visit. The farm is open everyday from 10-4.30. We spent a gorgeous day here as a family – everyone was happy and vegans, kids and dogs were all well catered for. The view to the beach is stunning as you drive down the narrow roads (silently praying you won’t meet a tractor head-on). There is a large car park that charges £3.90 for 3 hours £6.90 for the day, fairly reasonable compared to other beaches we visited. 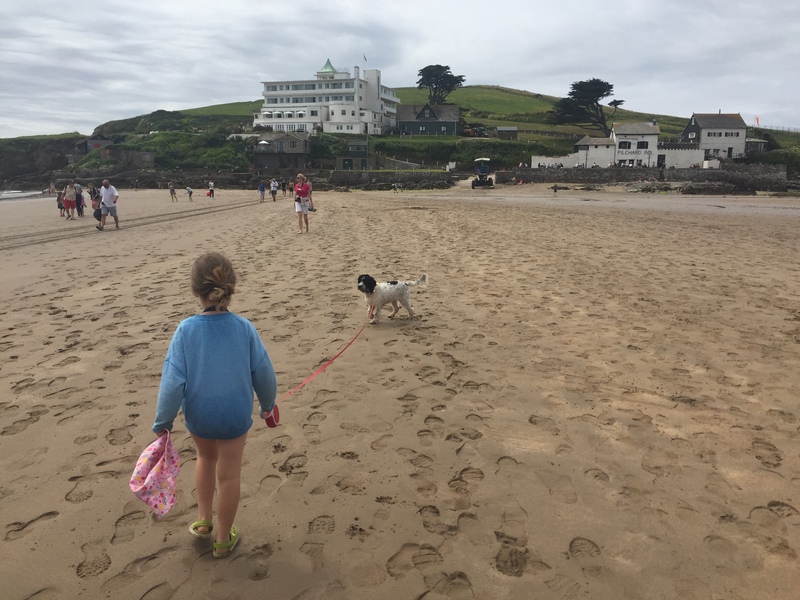 Although the main section of the beach is not dog-friendly, it’s only a few moments’ walk either side and your dog can run free dodging the waves gentle enough for a city puppy like ours more used to puddles than the Celtic Sea. 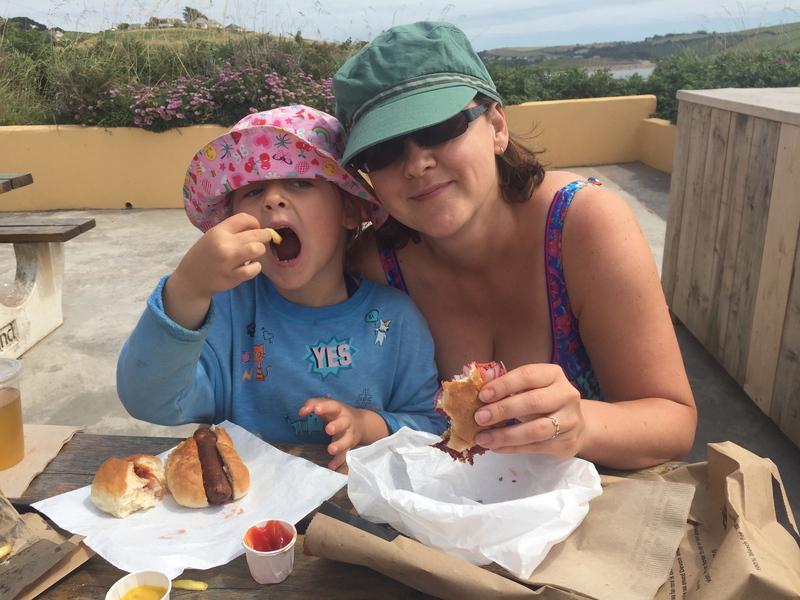 While waiting for the tide to go out a little later on – so we could walk the causeway to Burgh Island made famous by Agatha Christie’s mysteries based here – we stopped off at the Venus Café for lunch. 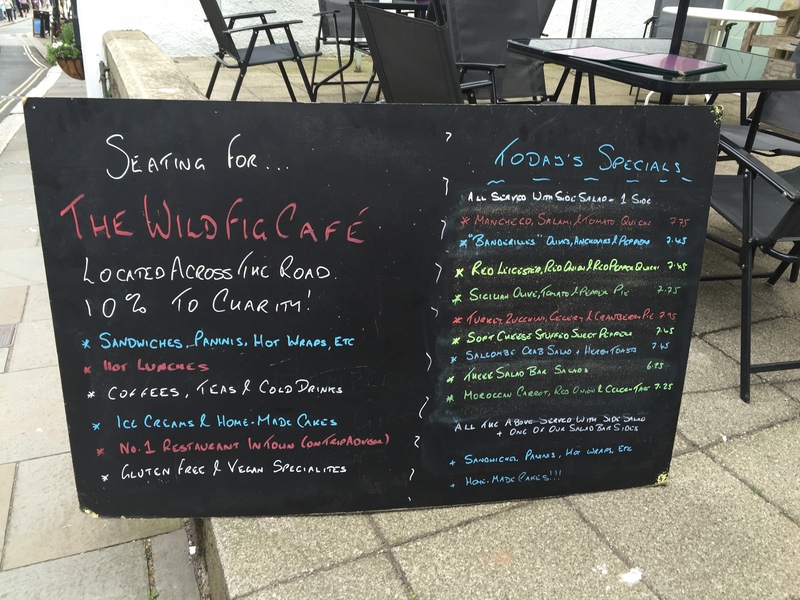 The café is responsibly run, with notices on marine welfare and rubbish (no plastic straws or polystyrene food containers here), and there is a great choice for vegans and veggies. My daughter had a vegan hot dog which went down well, and I was very impressed with the organic tofu and beetroot burger (minus the mayo) on offer. One of the best vegan burgers I have had, perfectly moist and washed down with a glug of vegan-friendly Tribute (Note: Tribute cans and bottles are okay, cask is not – so my Vegaholic app tells me). So often seaside cafes serve up appalling food, from freezer to fryer with no choices for vegans, so this was a refreshing and very pleasant meal. 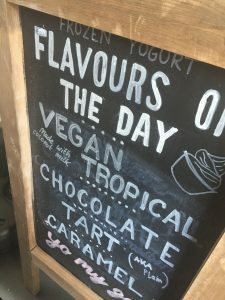 There is sorbet from Salcombe Dairy that is vegan too. Have you ever seen a baby hedgehog being fed milk? It’s about as cute as it gets, and here at the rescue centre it is a privilege to watch, as well as learn about these fascinating and endangered native animals. 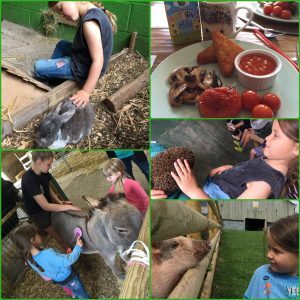 As well as the hedgehog hospital that rescues and rehabilitates hedgehogs from all around the South West, there are plenty of other farm animals to see, a café and various indoor and outdoor play areas for kids. It makes a wonderful day out and the hours flew by with animal activities every half an hour – perfect for impatient kids. We started off by helping to brush out the (rescue) donkey’s coats, then we learned about and stroked the hedgehogs, fed the pigs and played with the mice. Wilbur, a six-month-old piglet taken on by by the farm from a family who purchased him as a teacup piglet, turned out not to be so mini – and, as is so often the case, was a knockout charmer and seemed very jolly basking in the sun, happy in his new, more appropriately sized farm home. 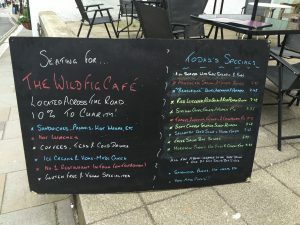 The café has lots of vegetarian choices, and some good vegan friendly snacks such as chocolate buttons, but nothing vegan listed on the menu – something I never quite understand at sanctuaries. Surely here more than anywhere animal-free food should be the norm. It seems so back-to-front to be caring and fussing over their own pigs while frying up others on the grill just a few feet away – a connection yet to be made. One would be horrified to read ‘hedgehog sandwich’ on the menu, but ham and bacon seems sadly acceptable and ever present. We hope Wilbur can’t see the café from his patch. The cook however was very happy to veganise the veggie breakfast for us and we had a nicely cooked fry-up of mushrooms, beans, tomatoes, toast and hash browns, which was plenty for us to share. Soya milk is available too, as well as plenty of juices for the kids. This is a gorgeous little place and makes for an especially sweet day out celebrating our native British wildlife – the Fox Hide is fantastic. Kids will have a blast here (no dogs though i’m afraid) and I’m not sure where else you can cuddle a hedgehog. It’s one to put on the bucket list then tick off at Prickly Farm. Totnes makes for a very vegan and dog-friendly day out. 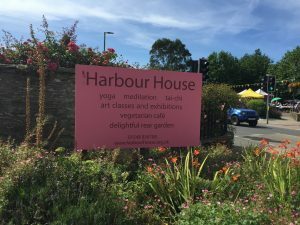 We spent half a day here and were spoilt for choice – everywhere we turned we saw signs offering vegan-friendly options. There is also a centrally located Holland and Barrett which is worth noting if you need to stock up on vegan-friendly essentials. 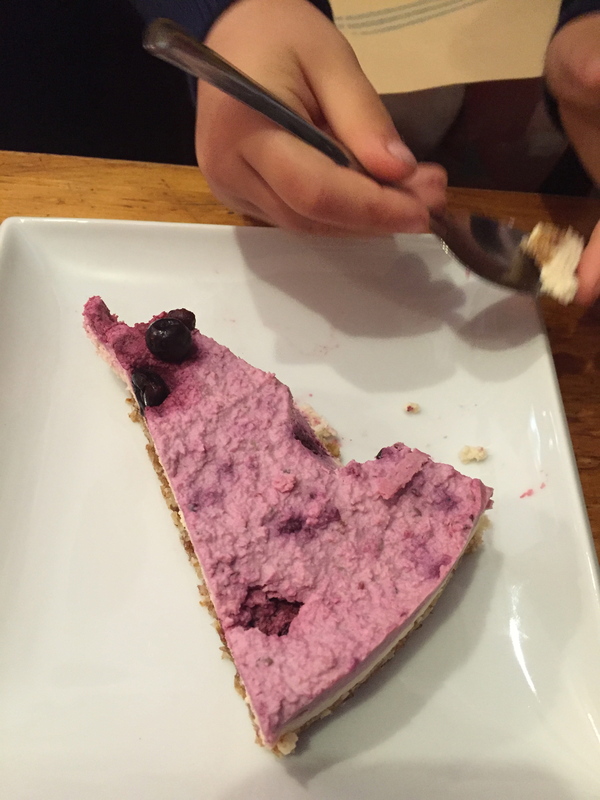 We stopped for a quick coffee and a slice of raw mixed-berry fridge cake at Thrive Café. A really homely and snug café with an arty feel. There is a lovely garden at the back, as well as tables out the front ideal for taking a weight off and for people-watching. It is mostly vegetarian-only choices rather than vegan so for coffee and cake its fine, but for lunch I would head elsewhere. They have a little store in there too selling bars, nibbles and the amazing and moreish Eat Real Hummus crisps that I am constantly hankering after. 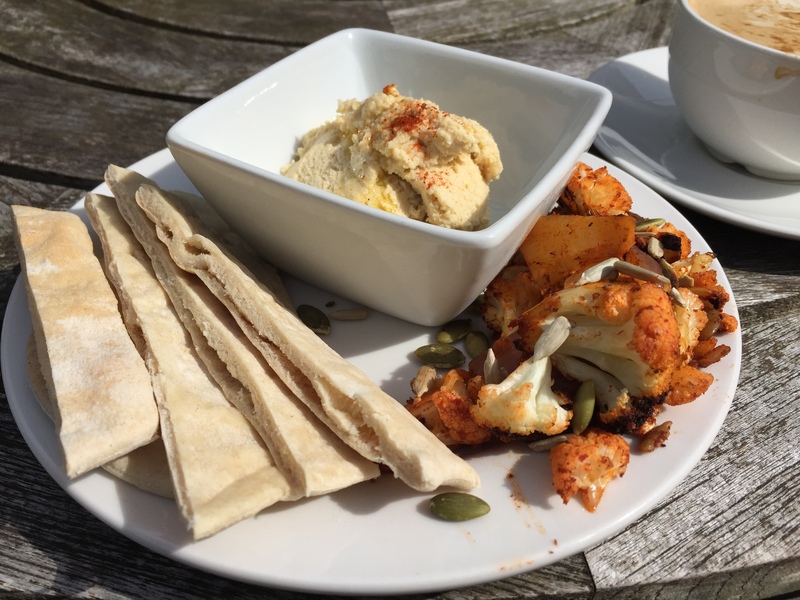 There was not time or stomach space to see or try everything vegan Totnes has to offer, which is a wonderful sign of plant-based food being plentiful and available here. Later, we passed the newly opened Destination Annie’s plant-based café. They were still setting out the food for the day and not quite ready for orders – but were very friendly as we popped our heads in. The specials board read nicely and can be found on their FB page. When we passed later it was full so we stopped at Annie’s Store next door which is an expensive but very well stocked market full of fresh, local and organic produce as well as selling a comprehensive range of wines, tins, non-dairy milks, dried food, treats and spices (meat, cheese and fish too are sold here). With bags loaded with fresh strawberries and veg for the evening’s meal, we stopped at The Wild Fig for lunch. The vegan choices are plentiful but the usual and predicable hummus, olives etc.. Feeling a bit annoyed we didn’t pick Fat Lemons for lunch instead, I was soon silenced as the food was fresh and good. The specials board did look more interesting but the vegan options hadn’t been marked off and the waiter was not sure what was suitable and I was too hungry to faff about so we ordered off the set menu. 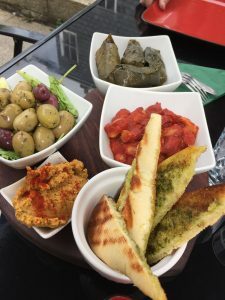 My daughter really enjoyed the buttered beans in tomato (mild) chilli sauce and herb toasts, and for me the stuffed vine leaves and home-made spiced hummus and roasted Mediterranean vegetables were very nice. The cola served is Whole Earth, a very refreshing and much nicer tasting change from CocaCola, which I don’t drink. The star of the show though was the coconut and chocolate cake, rich, velvety and very decadent – a smack of chocolate heaven. It vanished before I could even take a photo! Before hitting the road there was just enough time to try the vegan flavor of the day at Yo My Gosh ice cream parlour, a refreshing tropical flavored ice made from coconut milk, sold by weight. There was not time or stomach space to see or try everything vegan Totnes has to offer, which is a wonderful sign of plant-based food being plentiful and available here. Everywhere mentioned was dog-friendly. 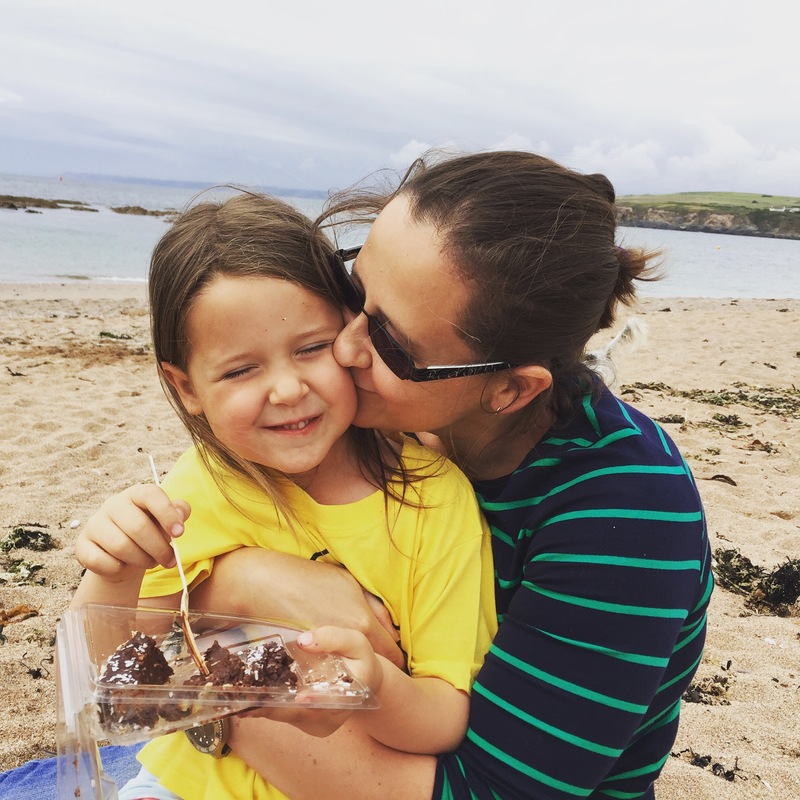 Top marks to Totnes – we will be back!